Gold, silver, platinum, and palladium represent four unique investment options today – here’s what you need to know to make an informed investment in precious metals. 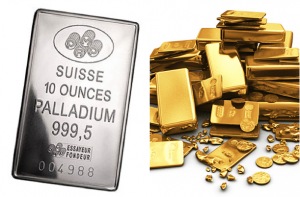 If you’re new to the world of investing in precious metals, it can be a little confusing. Which metals offer the best protection or return on investment? Is there one that is inherently more stable than the rest? Why is gold so popular today, but you rarely hear about palladium? These questions and more are all important, so let’s take a look at each precious metal listed above to uncover the important characteristics of each option. Gold retains its value well, and it acts as a powerful counterpoint to declining equity, real estate, or bond markets. Global instability can push investors towards gold since it is a universally-valuable commodity that isn’t linked to a country’s currency. And, since it has so much value per ounce, the physical storage of gold is quite easy to accomplish – $20,000 in gold only weighs about a pound! Gold is also the ideal hedge against financial market instability, as investors tend to flock to the precious metal to balance out overall risk in their portfolios. The bottom line: Gold is a durable and time-tested investment option for those who value stability and tangible worth. Can increase in value quicker than most other metals due to a greater connection to market volatility. It is becoming even more in-demand as emerging economies demand increasingly greater quantities of the metal to make electronic parts, electrical appliances, and medical products. Electric vehicle innovations will demand greater use of silver for microcircuits and batteries. The bottom line: Silver is an effective metal of value for any investment portfolio, but its most powerful characteristic is its use in industrial applications. This will keep it relevant and valuable for years to come. The industrial bias for this important metal will keep it relevant for a long time – thus, preserving its value. As governments continue to push for clean air reforms, platinum’s use in catalytic converters should deliver a strong upside for this important metal. Platinum is heavily mined these days in just two countries – Russia and South Africa. This points to the potential for some volatility, which can equate to rapid fluctuations and an ability to make serious gains in a short time. The bottom line: Platinum is generally regarded as the most volatile of the precious metals, but it can be lucrative if managed appropriately. The greater valuation swings inherent to palladium pricing makes it a choice for those looking to speculate or take advantage of short-term moves. Supply is generally shrinking as demand increases, which is the classic formula for price appreciation over the years. Palladium is used extensively in both automotive applications as well as in dentistry. Both fields are seeing significant growth as citizens of developing nations are driving more cars and people are living longer today – driving the need for more dental procedures. The bottom line: Palladium isn’t as popular as silver or gold, but it is a an unique investment option for most individuals as it is in shorter supply these days versus existing demand. How Can I Invest in Precious Metals? There are several options for investing in precious metals. You can opt for a metals-backed IRA, like a Gold IRA, Platinum IRA, and so on. Or, you can invest directly in precious metals-related companies via the stock market. Precious metals ETFs are also available, and they offer a different level of portfolio diversity since they invest in physical metal exposure and futures-based exposure. There are so many ways to invest in precious metals, so reach out to your preferred investment partner for more information about your options today.